We boast the area’s finest and widest variety of heirloom, organic and traditional vegetables, herbs and fruits. Our staff is knowledgeable and passionate about growing fresh produce from garden to table and would love to share their expert advice to help you succeed, too. We’ll even share our favorite recipes and harvesting and preserving tips! We are proud to offer a line of organic vegetables and herbs with all the accoutrements to help keep your garden organic, healthy and green. "Cucurbita Table Queen (USDA Organic) Acorn Squash, Cucurbita pepo 'Table Queen', is considered by some to be one of the best table squashes. 'Table Queen' is an excellent choice for baking. The 6"" long, acorn-shaped fruit has a hard, dark green rind with ribs and yellow to orange flesh, and although good for storage, it is best eaten before the skin changes to yellow. After harvest, this squash should be ripened for 30 days in a cool location. 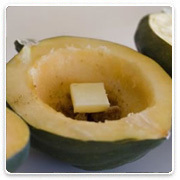 Table Queen Squash is a prolific bush version that can tolerate poor soil, and it is an heirloom acorn squash with high yields. It needs plenty of room to sprawl." "Brassica Gypsy (USDA Organic) Broccoli, Brassica oleracea 'Gypsy (Broccoli)', is versatile for summer or fall harvest and provides uniform well-domed heads with a medium-small bead size and medium-sized stem. Large, healthy plants tolerate heat and are resistant to downy mildew. 'Gypsy' is suitable for bunching or crown cut. Broccoli is high in Vitamins A and C and is also considered to be a cancer-fighting food. For best flavor, cook broccoli only until tender/crisp or use raw with dips or in salads. 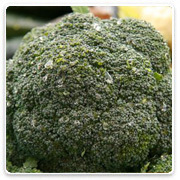 Broccoli freezes very well, maintaining its color, texture and taste. Broccoli is a rewarding vegetable to grow and is best planted in soil rich with organic matter where it will be better able to fight disease. Harvest when the broccoli buds of the head are firm and tight, cutting 5 to 10 inches down on the stalk. This will promote the growth of side shoots which will provide an abundance of smaller broccoli heads over a long period. " "Brassica Premium Late Dutch Flat (Organic USDA) Cabbage, Brassica oleracea 'Premium Late Dutch Flat (Cabbage)', offers large, broad, flat heads, weighing 10 to 15 pounds and measuring 7 x 14 inches. The low-growing heads (big, flattened, full and solid) have a short core and excellent wrapper leaves. Premium Late Dutch Flat grows quickly with the onset of cool, wet weather. 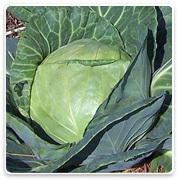 Premium Late Dutch Flat Cabbage has very good keeping quality, and is one of the best winter keepers. Suitable for home gardens and market growers. Cabbage is a hardy vegetable that grows especially well in fertile soils. Cabbage is easy to grow if you select suitable varieties and practice proper culture and insect management. Always regarded as a good source of vitamins, cabbage recently has been shown to have disease-preventive properties as well." 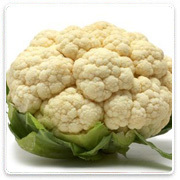 "Brassica Freemont (USDA Organic) Cauliflower, Brassica oleracea 'Fremont (Cauliflower)', is a very dependable and adaptable cauliflower variety. 'Freemont' is a uniform but self-blanching type. It is an annual plant in which only the head (the white curd) is eaten while the stalk and surrounding thick, green leaves are used in vegetable broth or discarded. Cauliflower is very nutritious, and may be eaten cooked, raw or pickled. The preferred garden soil for cauliflower is well drained, moist and has significant organic matter with a pH of 6 to 7. 'Fremont' is a very popular variety with 2 to 2.5 pound heads that are white and do well when planted, either late-spring or early summer. You will receive a dependable yield with Fremont. In cooler regions, like the Maritime Northwest, cauliflower can be grown for summer and fall harvest. In milder areas with longer growing seasons and less risk of heavy freezes, they can overwinter, and be harvested in the spring." 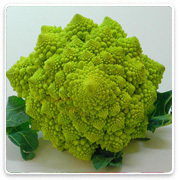 Cauliflower 'Romanesco' has heads that are lime green with pointed, spiraled pinnacles. Cauliflower is best planted in summer for harvest in the fall, or midwinter in mild climates. Plant 18" apart to give the large plants adequate space. Mild, nutty taste. Chard 'Bright Lights' This multicolor chard was a 1998 All-America Selections winner. Stems of many colors including gold, pink, orange, purple, red, and white with bright and pastel variations. 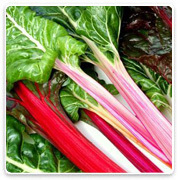 The taste is milder than ordinary chard, with each color a bit different. "Cucumis Marketmore 76 (USDA Organic) Cucumber, Cucumis sativus 'Marketmore 76', is a slicing cucumber that has 8-9"" long, slender, dark green fruits that maintain their uniform color, even under weather stress. Marketmore 76 begins bearing late, but picks for a relatively long time. It remains dark green even in hot weather, has a sweet mild flavor, tapers at both ends, blocky, white spines, and no stippling. Good for both home gardens or market in cool climate areas. 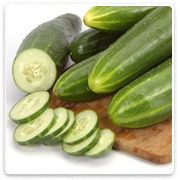 Cucumbers originate from India where they have been cultivated for over three thousand years. The cucumber is a quick growing subtropical vine. In fact, many varieties of cucumbers are ready to harvest after only fifty days. They can be trellised if desired. A bit of afternoon shade is helpful in very hot summer-areas. Supply abundant moisture and continue to harvest fruit, even if misshapen, to keep vines productive." 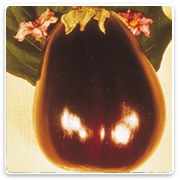 The Eggplant Black Beauty, 'Solanum melongena', produces broad, egg-shaped fruit with dark purple skin on 24" to 28" plants. Black Beauty grows well in most areas. The large spreading plants are capable of producing 6 to 12 fruits on each plant. Eggplant is a very international vegetable. The unique and tasty dishes cooked in japan, China, Italy, Russia and other countries make eggplant a useful and tasty vegetable for your garden. Try eggplant dipped in flour and sauteed in olive oil, stir fried with bean sprouts, peppers, and tomatoes, or roasted and combined with olive oil, chopped onions and tomatoes. Plant in the spring, 3 to 4 weeks after the last average frost date. Warmer ground temperature promotes faster growth. If nighttime temperatures drop below 60 degrees, the fruit will not set. Eggplant prefers rich, deep, loose soils with large amounts of organic material. Provide 1 inch of water a week if it does not rain. 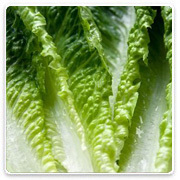 (USDA Organic) Lettuce Bib/Romaine, 'Winter Density', This lettuce variety will withstand light frosts and produces 8 to 10" high upright heads with crisp, dark green leaves. Best suited for mature salad mixes in both summer and fall. 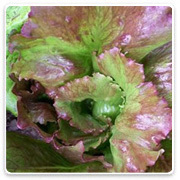 "Lactuca Pablo Batavian (USDA Organic) Lettuce - French Crisp, Lactuca sativa 'Pablo Batavian', is a wine-red lettuce with slight hints of deep green. Loose heads grow beautiful enough to use as an ornamental plant. The large round wavy leaves have toothed edges with sweet, mild flavor. This purple crisp-heading lettuce stands well without bolting or becoming bitter. French Crisp has upright rosettes of crunchy green leaves overlaid with dark purple, and it can be picked a few leaves at a time or left to make a firm head. " 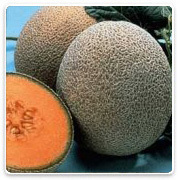 Cucumis Hale's Best (USDA Organic) Muskmelon, Cucumis melo 'Hale's Best', produces 4 to 5 lb. fruits measuring 5-1/2 x 7". The oval fruits of 'Hale's Best' are heavily netted and lightly ribbed. This is a drought-resistant variety with a sweet flavor, and it resists powdery mildew. Hale's Best is a great tasting melon with aromatic, sweet, firm, salmon-colored flesh, a yellow-green rind with a heavy coarse net and light rib. Melons love heat and are very frost sensitive. "Allium (USDA Organic) Walla Walla Onion, Allium cepa 'Walla Walla', is a large, sweet Spanish onion with light-brown skin and mild white flesh. Famous for its sweet flavor in fresh eating. Very cold hardy, it can be directly sown in mid-spring. 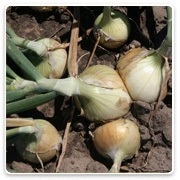 'Walla Walla' is perhaps the most popular sweet onion with a nice mild, sweet flavor and non-pungent aroma. Some people eat them like apples. Walla Walla grows to 4 inches across. 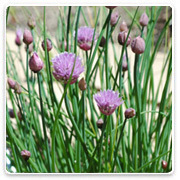 Onions are a hardy biennial grown as annuals. Leaves and flower stalks are hollow and bases swell to form a bulb. Walla Walla is a long day onion. “Long day” type onions, which need 13-16 hours of daylight, do best in the North; “Short day” types do best in the South. “Day-neutral” types grow well anywhere." Pickles 'National Pickling' Developed by the National Pickle Packers Association in collaboration with the Michigan Agricultural Experiment Station, this is the pickling cuke that pickle growers asked for. High yielding, early fruit on vigorous, medium vines that retain quality over a longer season than Northern Pickling. Dark green fruit are 5-6" with black spines. Spinach 'Tyee' is a fast-growing, slow-bolting, semi-savoy spinach, it is very attractive with slightly rumpled dark green leaves. 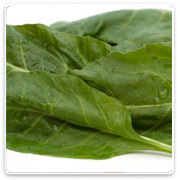 Spinach 'Tyee' is especially recommended for spring, fall and over-wintering crops. Ideal for salads, cooked greens and soufflés. 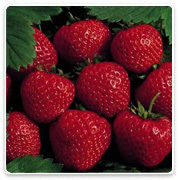 (Strawberries-Everbearing) Strawberry 'Ozark Beauty' is a long time favorite and is excellent for preserves or freezing. Large red berries with mouth-watering flavor. The absolute hardiest, most vigorous and one of the heaviest producing everbearing plants. You?ll be feasting on big crops of these exceptionally delicious scarlet-red berries from early summer until the first frost. The Strawberry Allstar, Fragaria 'Allstar', a spring planted herbacious root, produces consistantly large, light colored strawberries year after year. 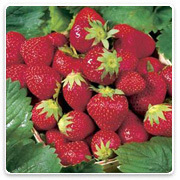 The Strawberry Allstar is a June-bearing strawberry that is very disease resistant. It produces sweet, extra juicy berries and is very hardy. strawberries are a common variety of strawberry cultivated worldwide. 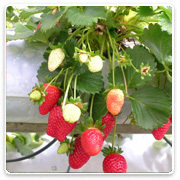 Like other species of Fragaria (strawberries), it belongs to the family Rosaceae. Technically, it is not a fruit but a false fruit, meaning the fleshy part is derived not from the plant's ovaries (achenes) but from the peg at the bottom of the bowl-shaped hypanthium that holds the ovaries. 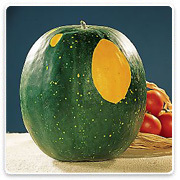 Massive fruit -- up to a staggering 50 pounds apiece -- have thick, ridged rinds marked with moon- and star-shaped golden patches! 100 days. Probably the most beautiful -- and unusual -- watermelon ever grown, this heirloom is also one of the sweetest! Most of the fruit is 25 to 30 pounds, but the occasional over-achiever balloons up to 50, protecting the succulent juiciness of its bright red flesh with a deeply-ridged, very thick rind! An early, small-fruited 'icebox' type. 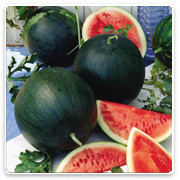 Fruits are round, 6-8 inches in diameter weighing from 5-8 lbs. The dark green rind is hard and not easily damaged. Flesh is bright orange-red in color, sweet and crisp. Maturity of 75-80 days. Approx. 85 sds/pkg. "Cucurbita Raven (USDA Organic) Zucchini, Cucurbita pepo 'Raven', displays a dark green skin that contains high levels of lutein, a highly effective antioxidant. Open plants are high-yielding, producing glossy, smooth, cylindrical fruit that get 7 or 8 inches long and about 2 inches in diameter. The fruits grow very abundantly all over plants that are just 2 feet high and 3 feet wide. You should not set your zucchini plants in the garden until the temperature in your area is at least 65 degrees Fahrenheit. 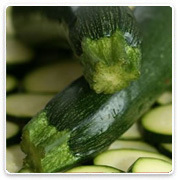 Zucchini should be planted in a mound that is approximately two feet in diameter. You can add well-rotted manure to the soil prior to building up the mound. Love Zucchini but just don't have the space for those big, sprawling plants? Raven Hybrid is the answer -- a truly compact variety that improves every stage of the process, from saving space in the garden, to simplifying harvest with spineless fruit, to delighting your taste buds with fruit much meatier and more flavorful than older varieties! This is the perfect variety to eat raw, or lightly steamed it and bring out the most of the fresh, full flavor." Pepper 'Bulgarian Carrot (HOT)' The seed of this charming heirloom was reportedly smuggled out of the Iron Curtain a quarter century ago. Extremely productive 18" tall plants produce 3 ½" fruits which grow very close to the stem and ripen from green to a bright yellow-orange color. 'Bulgarian Carrot' pepper glows with a brilliant hue and intense flavor, fruity and pungent at the same time; it adds a colorful tint to glazes, marinades and salsas. "Capsicum Fish (USDA Organic) Pepper Heirloom, Capsicum 'Fish', is an heirloom that is considered by many to be the best variety to use when cooking fish and shellfish and is also perfect for salsa. 18"" to 24"" tall plants feature decorative green and purple foliage splashed with white. High yields of very hot, 2"" long pointed fruits ripen from white with green stripes to orange with brown stripes and then to brilliant red, some may also become deep purple as well. Often used in fish and shellfish cookery. This variety is really fun to grow and looks at home in an ornametal garden. 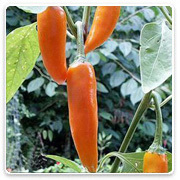 Capsicum refers to a wide variety of tropical pepper plants with the genus of the same name. The name is perhaps derived from the Latin ""capsa,"" or box for the pod-like fruit. They are also frequently used both chopped and raw in salads, or cooked in stir-fries or other mixed dishes. They can be sliced into strips and fried, roasted whole or in pieces, or chopped and incorporated into salsas or other sauces. Capsicum is a relative of the tomato and requires similar growing conditions." "Capsicum Joe's Long Cayenne (USDA Organic) Pepper Heirloom, Capsicum 'Joe's Long Cayenne', is a variety that originates from Calabria, Italy. The unbelievably long, slender fruits of 'Joe's Long Cayenne' are 8"" to 10"" long, thin-skinned, and taper to a small point. It turns bright red for homemade hot sauce and dries well for ristras and delicious, dried hot pepper flakes. 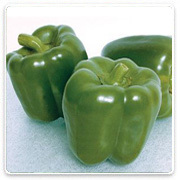 Capsicum refers to a wide variety of tropical pepper plants with the genus of the same name. The name is perhaps derived from the Latin ""capsa,"" or box for the pod-like fruit. They are also frequently used both chopped and raw in salads, or cooked in stir-fries or other mixed dishes. They can be sliced into strips and fried, roasted whole or in pieces, or chopped and incorporated into salsas or other sauces. Capsicum is a relative of the tomato and requires similar growing conditions." Pepper 'Tennessee Cheese' originally came from Spain where it is still used to produce high quality paprika. We think it is one the best peppers for stuffing. The fruits are round - apple shaped. It has a flattened base with a thick delicious skin. 'Tennessee Cheese' is often used the same as a bell pepper, or is pickled to use as a garnish, or canned for pimientos. They are also dried for paprika. "Capsicum Tollie's Sweet (USDA Organic) Pepper, Capsicum 'Tollie's Sweet', displays versatility, and this Italian heirloom has made it a favorite of many gardeners. Sweet, red fruits are great for eating fresh, canning, or making sauces. 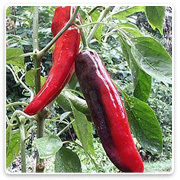 Pepper 'Tollie's Sweet' are easy to grow and produce dependable yields of 4"" to 5"" tapered fruits that start out green and ripen to deep red. 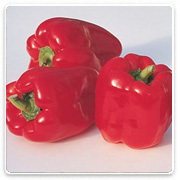 Capsicum refers to a wide variety of tropical pepper plants with the genus of the same name. The name is perhaps derived from the Latin ""capsa,"" or box for the pod-like fruit. They are also frequently used both chopped and raw in salads, or cooked in stir-fries or other mixed dishes. They can be sliced into strips and fried, roasted whole or in pieces, or chopped and incorporated into salsas or other sauces. 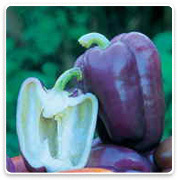 Capsicum is a relative of the tomato and requires similar growing conditions." Pepper 'California Wonder' is great for stuffing, but tasty enough for salads, 'California Wonder' is an excellent sweet bell for cold climates. 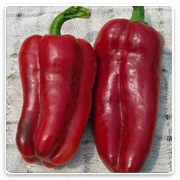 In longer season climates, peppers turn bright red after maturing. More vitamin C than an orange! A good container variety. Brilliant bright orange extra thick-walled bells are juicy and sweet. Widely adapted and easy to grow. A blocky, thick-walled bright orange sweet bell pepper with heavy yields. 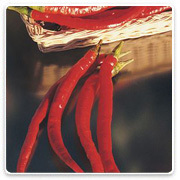 Pepper 'Spanish Spice'(HOT)The flavor and aroma of this pepper make it a great choice for grilling or frying. The 7" fruits of 'Spanish Spice' look like a green chili pepper but are more spicy than hot. 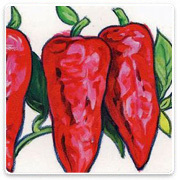 The thin walls allow this pepper to cook quickly and are also used raw in salads. 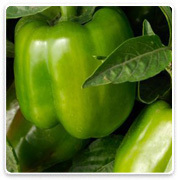 Pepper 'Giant Marconi' is a large, tapered, pepper whose fruits grow to 8" by 3", with a sweet, smoky flavor that's equally delectable when eaten green or red, fresh or grilled. 'Giant Marconi' is widely adaptable, it produces larger than normal crops just about anywhere. Withstands severe weather and disease. Light lavender skin, pale yellow flesh. 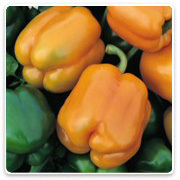 3-lobed, medium-size, thick-fleshed peppers with a mild, lightly sweet taste. Fruits ripen through a showy stage of violet, yellow and orange streaks, eventually turning a rich, very dark red. Strong, medium-tall plants yield well. 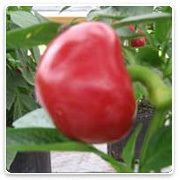 Pepper 'Orion' are plants with bountiful foliage that produce large, smooth, thick-walled fruits. At 65 days the fruit can be harvested green or if left on the plant will turn red at about 85 days. 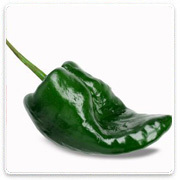 Pepper 'Poblano, Ancho' is a very popular chile pepper in Mexico. 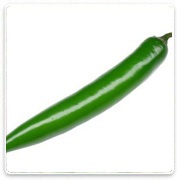 Medium hot, broad-shouldered fruits are often used for making chile rellenos and mole. 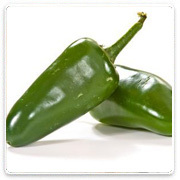 It is known as 'Poblano' when fresh and 'Ancho' when dried. Pepper 'Red Ace' is known for its amazing yields of medium-sized, 3 to 4-lobed, green bell peppers, 'Red Ace' is a great selection for northern climates; glossy green peppers turn red early. Very productive, nearly every flower produces a pepper. 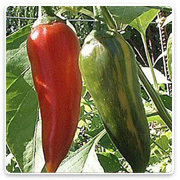 Pepper 'Serrano del Sol'(HOT) This hybrid Serrano matures earlier and is larger than traditional varieties. The 3" long fruits begin dark green and turn to red when mature. The unique flavor of 'Serrano del Sol' makes it a great choice for cooking and is not excessively hot. Generations of gardeners have delighted in the flavorful fruit and unique color of heirloom tomatoes! 'Brandywine', one of the best known and widely grown heirloom tomatoes, has very large fruit with deep pink skin and red flesh. Gourmet restaurants across the country feature this amazing tomato. Water well in warm weather. May need staking. Generations of gardeners have delighted in the flavorful fruit and unique color of heirloom tomatoes! 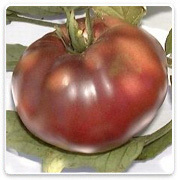 'Cherokee Purple', said to be traced back to a variety used by the Cherokee Indians, has the tangy, sweet, true tomato flavor that nature intended. Gourmet restaurants across the country feature this medium-large, distinct fruit with dark burgundy to purple skin and flesh. Water well is warm weather. 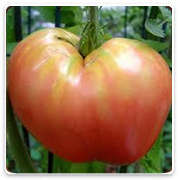 Tomato 'Coure di Toro' is a large, oblong, pink Oxheart type tomato. 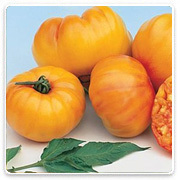 'Coure di Toro' has thick flesh, sweet flavor, it may grow to 2 lbs. An Italian heirloom. 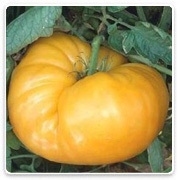 Tomato 'Dixie Golden Giant' This heirloom has been grown by the Amish since the 1930's. 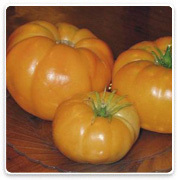 Large, 1-2 pound golden-yellow beefsteak fruit have a delicious, fruity flavor with few seeds. 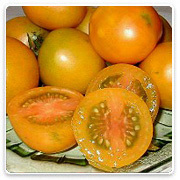 Tomato 'Dixie Golden Giant' tends to mature earlier than similar varieties and has vigorous vines. Generations of gardeners have delighted in the flavorful fruit and unique color of heirloom tomatoes! 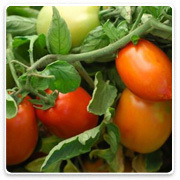 This delicious salad tomato starts out light green and ripens to an amber-green with dark forest green stripes. 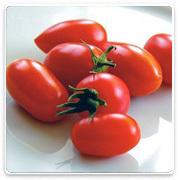 Gourmet restaurants across the country feature this 3 ounce tomato which has a sweet, flavorful, yet tart and zingy taste. It takes four heirloom varieties to make up the combination of breeding to establish this one unusual looking masterpiece tomato! You will find it is a real tasty treat with good yields in the garden! Use in soups, salads, sauces, cooked dishes, and on sandwiches for lush, vine-ripened, sun-warmed, juicy, and ready to burst flavor! Very vigorous determinate vines. Crack resistant. Water well in warm weather. 75-80 days to maturity. This is one of the tastiest and most prolific tomatoes I've ever grown, and it was the first tomato to ripen in my garden in 2006. Jaune Flammee is an heirloom tomato from France. The fruits are the size and color of an apricot with a delicious, fruity and tangy flavor. 19th century heirloom from the hill people of East Kentucky. Huge, tasty orange beefsteaks with a fine, mild flavor. Ind. 100 days. 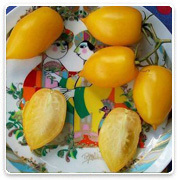 Tomato 'Roman Candle' The pure-yellow, banana-shaped, paste-type fruit are 4 to 6 inches long. The superior flavor of 'Roman Candle' tomatos combined with the meaty flesh make it a great choice for salsas and sauces. The bright yellow skin combined with the white flesh add visual interest as well. 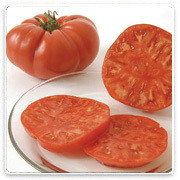 Tomato 'Rutgers' is an attractive, old-time favorite with a full-bodied flavor. 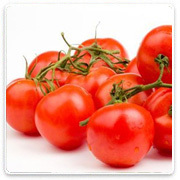 Ideal for canning, 'Rutgers' ripens from the inside out providing bright red 7 oz. fruits. Disease resistant. Tomato 'Soldacki' These dark pink beefsteaks weigh one pound or more and have a wonderful, sweet yet complex flavor that rivals Brandywine. They are produced in good numbers in the late midseason. 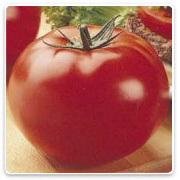 'Soldacki' tomato originated in Krakow, Poland. It was brought to Cleveland, Ohio around 1900. Potato-leaf foliage. 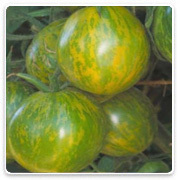 Tomato 'Striped German' The flat, medium to large, variably ribbed-shoulder tomatoes are shaded yellow and red. The marbled interior looks beautiful sliced. The flavor is considered complex and fruity with a smooth texture. Tomato 'Thessaloniki' This heirloom tomato comes from Greece. The large, red fruits are 3-4" in diameter and weigh about 6 oz. Great tomato flavor. 'Thessaloniki' was introduced to the USA in the 1950's, and it has been popular ever since. It's very productive, and it doesn't crack. 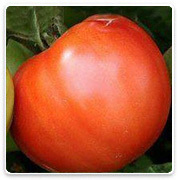 Tomato 'Big Beef' This hybrid overcomes adverse growing conditions and adapts to virtually any climate. The smooth skinned fruits are globe-shaped, 9 to 16 oz. and disease resistant. The uniformity of this hybrid also provides an old-fashioned, rich flavor. Tomato 'Big Boy' F1 Hybrid. One of the most popular varieties grown by home gardeners. Plant produces good yields of very flavorful 1 lb meaty tomatoes. 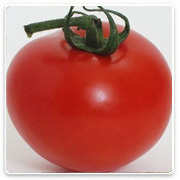 'Big Boy' tomatoes turn bright red when they are mature. Crack Resistant. 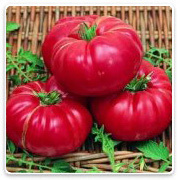 Tomato 'Juliette' is a cherry-type tomato that offers 1 oz. elongated fruits with glossy, red-skin that cling to the vine longer than most other cherry-types. 'Juliette' is very sweet and resistant to cracking. 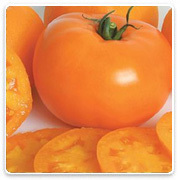 Tomato 'Orange Blossom' is a very good early orange tomato. The fruit is medium-firm, globe-shaped and average 6-7 oz. 'Orange Blossom' texture is pleasant and the mild flavor is balanced with a little acidity. 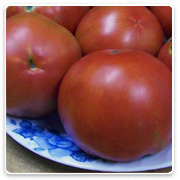 Tomato 'Roma' produces heavy yields of 3" long red plum shaped tomatoes. 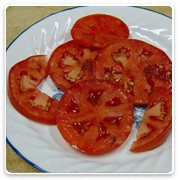 'Roma' tomatoes are flavorful and have very few seeds. One of the most popular varieties for paste, sauce, ketchup, and canning. Disease Resistant. 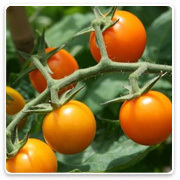 Tomato 'Sungold' is a golden cherry tomato that is very productive offering its fruits very early in the season. 'Sungold' fruits are light orange colored, thin-skinned and very sweet. Tomato 'Super Sweet 100' Staked plants produce long strands of 100 or more super-sweet cherry tomatoes weighing about 1 oz. and are 1" in diameter. Fruit is available throughout the entire season and are high in Vitamin C.
Ocimum basilicum 'Genovese' is an annual native to India, Africa, and Asia. 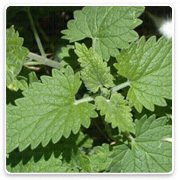 One of the most popular herbs, it is now cultivated in all temperate climates throughout the world. 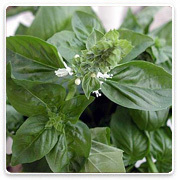 Of all the basils to grow, and there are about 150 varieties, Genovese basil is one of the best because it yields 7 to 8 cuttings and makes the best pesto. Nepeta cataria. 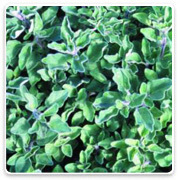 This aromatic herb has gray, hairy foliage with blue flowers in July-September. Use in teas. Dried leaves are used to stuff cat toys. Plant in the border garden in rich well drained soil. Matricaria recutita. 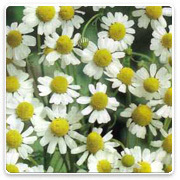 This aromatic herb has finely cut spreading foliage and lovely white and yellow, daisy-like flowers in July. 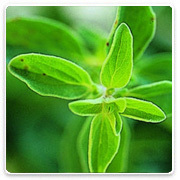 The sweet and mild flavor of the leaves and flowers are used in herbal teas and hair conditioners. Plant in the border garden in average, well-drained soil. Allium schoenoprasum. A grass-like perrennial herb with thin tubular foliage and edible purple rose flowers in June. Flowerheads can be cut and used in floral arrangements. Great with potatoes and eggs or as a garnish for soups, salads, soft cheeses and sauces. Best grown in containers or garden borders in average, well-drained soil. 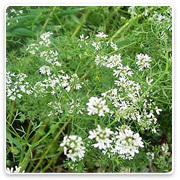 Coriandrum sativum A widely used annual herb with flat parsley-like leaves and white flowerheads in summer. The fresh leaves are ideal for South-East Asian, Mexican and Middle-Eastern cuisines. The seeds and roots are also good for pickling. Plant in average, well-drained soil. 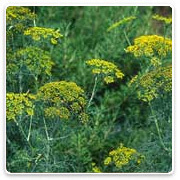 Dill is one of those herbs that in effect has two different seasons. In early spring it is used for its leaves and then later in fall for its seeds. Each part of the plant has its own characteristics and properties. With its crisp grassy taste, dill leaves, or "dill weed" as it is called, is a natural to be paired with fish, mild cheeses, egg dishes, vegetable dishes, cream sauces, and it is especially good on potatoes. 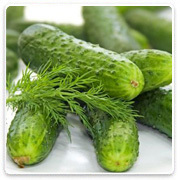 Cucumbers are another food that partners well with dill, either in salads, chilled soups or on tea sandwiches. Dill has a simple, clean taste. When using dill leaves, it is best to use it fresh rather than dried to get the most flavor. If using dill in a hot dish such as a stew or a sauce, be sure to add it just before serving, as it loses its flavor in the heat. Mentha x piperita. 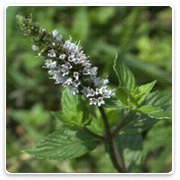 Aromatic, dark green leaves with a strong peppermint flavor and mauve flowers in summer. Use fresh as a flavoring in desserts, iced drinks, salads and garnishes. Leaves can also be immersed in hot water for a soothing herbal tea. Popular in potpourris and sachets. Plant in herb gardens and containers in rich, moist soil. 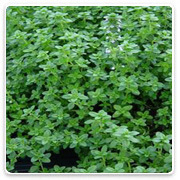 Origanum heracleoticum "Greek Strain". An culinary herb with small gray-green spreading foilage. Edible white to purple flowers in summer. Use fresh or dried to add flavor to Italian, Greek and Mexican cuisine. Best planted in borders and herb gardens in well drained soil, and is useful as a ground cover. Biennial – Plant 9-12” apart. Must be covered to protect from cold weather in the winter.Parsley is one of the most popular culinary herbs. 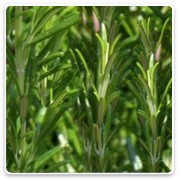 It is a flavorful ingredient in savory dishes and also helps to create an attractive presentation for your table. 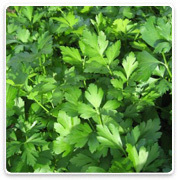 Available in a number of varieties from double-curly leaf to flat leaf, most parsley types need similar conditions in which to thrive. Growing parsley indoors presents some challenges that don't occur went planting this herb in the garden, but it can still be very successfully grown as an indoor plant if a few important conditions are met. Rosemarinus officinalis. Beautiful shrubby herb with bluish-green, needle-like foliage and edible blue flowers. Sprigs may be used fresh or dry in meat dishes, soups and stews and to flavor oil and vinegar. Also used as a medeicinal herb. Ideal for garden borders, grown as an informal hedge, or potted topiary. Plant in average well-drained soil in full sun. Salvia officinalis. 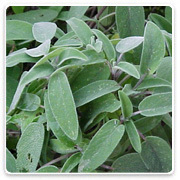 This aromatic perennial herb has downy silver-gray leaves and edible blue flower sin summer. Perfect as seasoning for stuffings and sausages, or used dry to make a soothing tea. Also used as a medicinal herb. Plant in garden borders in average, well-drained soil. Of all the old-fashioned herbs, thyme is one of the most beloved. Its many varieties are consistently lovely and easy to grow, alone or in combination with other flowers or herbs. Both the foliage and the clusters of tiny flowers are beautiful, varying widely in color depending on the cultivar. The flavor of this plant is essential in many herbal combinations, especially in meat and tomato-based dishes, and is excellent with mushrooms, cheeses, and soups. Honey made by bees feasting from thyme flowers is delicious.